You can become motivated beyond what you ever thought possible. question your training, success you have had thus far and began to self sabotage yourself. The CrossFit Open is a way to provide context to your training and gives you purpose behind everything you have been working for in the gym day in and day for the past year. Competition can bring out the best in you. I fully believe that you can not recreate the enviornment, intensity and your highest level of performance during the heat of this great competition. Participating will put you in the game with 60,000 plus competitors and can result in raising the expectation for yourself. You will operate at a much higher level because everyone else is operating at a much higher level. And by you pushing yourself you in turn will push others around you. It is infectious! Competition can you show you the light to your potential. You can be a part of something much bigger then yourself. You can see how people really not that much different than you can put up extroridinary numbers. season provides do not let yourself fall into the trap of COMPARING yourself to others performances. This kind of comparing is you actually judging yourself against people that you know very little about. You have no idea what type of work these people put into to produce their results. You don't know what kind of athletic background they have. You can't compare yourself to someone who is a former competitive gymnast, or has been weightlifiting for 10 years, or played college sports, and you just started CrossFitting 6 months ago?!?! You are exactly where you are supposed to be. All of you efforts you have done in the last year, all of your training prior to CrossFit, your entire fitness/sports history has brought you exactly where you stand today. And the same goes with the people you can't help but compare yourself too. Be proud of yourself. Your progress. Your results. The potential you have. If you feel the need to compare yourself to others there are plenty of stories on the games site. And plenty of success stories that have people with far less physical advantages in life than you. 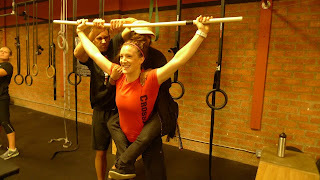 My hope is you use the 2012 CrossFit Games Open as a measuring stick for yourself. I hope you use the positive energy of 60,000 plus people across the globe to catapult your mental and emotional inspiration to a level you never thought possible for yourself. thanks for clarifying something that most crossfitters don't want to hear from a coach. you comments about the trap are TRUE to the core. Thanks for the comment Dan! Good luck to you and your athletes with the rest of the open. Antagonizing others, indeed, can turn to be harmful. Everyone must set his/her own goals that -obviously- are related to the starting condition and -ofcourse- the special and unique characteristics of the structure/body of the individual. Furthermore, exceeding your limits the wrong way may cause injuries and pain.